The name sounds funny, but Hemlock Wooly Adelgid ("HWA") is no laughing matter. Accidentally introduced to North America from Japan, HWA was first found in the eastern United States near Richmond, Virginia, in 1951. The pest is now found from northern Georgia to southwestern Nova Scotia. According to Wikipedia, as of 2015, 90% of the geographic range of the eastern hemlock in North America had been affected by HWA. 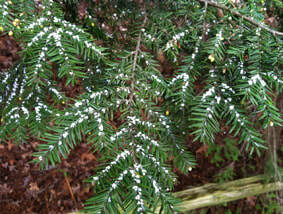 The Hemlock Wooly Adelgid was first spotted in parts of South Cumberland State Park in 2012. According to the Tennessee Department of Agriculture, "Since its detection in Tennessee in 2002, HWA has spread to 42 counties in East Tennessee and the Cumberland Plateau. The main vectors that allow HWA to spread rapidly are storm winds and migratory birds, as well as “hitchhiking” on mammals and humans. Infested nursery stock can also transport the insect into new areas. Hemlocks provide invaluable ecological benefits to the forest such as habitat, stream temperature regulation, and stream bank stability. Loss of these values will not only disrupt the delicate natural systems in the forest but also affect aesthetic and recreational benefits." Just imagine some of our deep, cool, hemlock-shaded canyons without any hemlocks, and you'll get the idea. Hikers and campers in the Park can help in the battle against the adelgids by being on the lookout for HWA infestations. The Tennessee Department of Agriculture describes the Hemlock Woolly Adelgid as tiny, less than 1/16-inch long, and varying from dark reddish-brown to purplish-black in color. As it matures, it produces a covering of wool-like wax filaments to protect itself and its eggs from natural enemies and prevent them from drying out. This “wool”, which is its ovisac, is most visible when the adelgid is mature and laying eggs. Ovisacs can be readily observed from late fall through early summer on the underside of the outermost branch tips of hemlock trees. The “wool” has also been described as looking like tiny cotton balls (see photo at right). A sign of more advanced HWA infestation is discoloration of foliage and thinning in the crown of the tree. This is due to HWA's disruption of nutrient supplies to the hemlock foliage, and causes the needles to change from deep green to a grayish green and then fall off. However, since other hemlock pests can cause some of these symptoms as well, positive identification for HWA on the foliage (i.e., the distinctive white "wool") is needed. Once established on a tree, HWA quickly populates all needles of the tree, causing the tree to die within 3 to 6 years of infestations. If you see HWA "wool" on the outermost branch tips of any hemlock tree in the Park, please visit the Park office at the Visitor Center (or call 931-924-2980) and provide a detailed description or GPS coordinates of your location, and also share a photo of what you saw. You may also wish to contact the Tennessee Division of Forestry at 615.837.5432. Do not collect or move infested hemlock materials. On the plus side, because the HWA threat has been widely known for some time now, coupled with the fact that HWA was not spotted in South Cumberland State Park until relatively recently, the Tennessee Department of Forestry and allied agencies have had a better opportunity to anticipate its arrival, and formulate a plan to protect at least some of the hemlock stands in the Park. The Tennessee Hemlock Conservation Partnership, which encompasses staff from the Tennessee Wildlife Resources Agency, Tennessee Department of Environment and Conservation, Tennessee Division of Forestry, National Park Service, The Nature Conservancy, US Forest Service, University of Tennessee, as well as concerned individuals, have identified Hemlock Conservation Areas (HCAs) on public lands, including portions of South Cumberland State Park, where treatment to save hemlocks is taking place over the next several years. The THCP is accepting donations that will be used to treat priority Hemlock Conservation Areas on state public lands. For more information and to make a donation, visit the Tennessee Wildlife Resources Foundation. If you would like to volunteer to treat hemlock trees on public lands, please contact Heather Slayton at Protect.TNForests@tn.gov.